1. Prep basil (2 cups packed), by removing the leaves from the stems. 2. 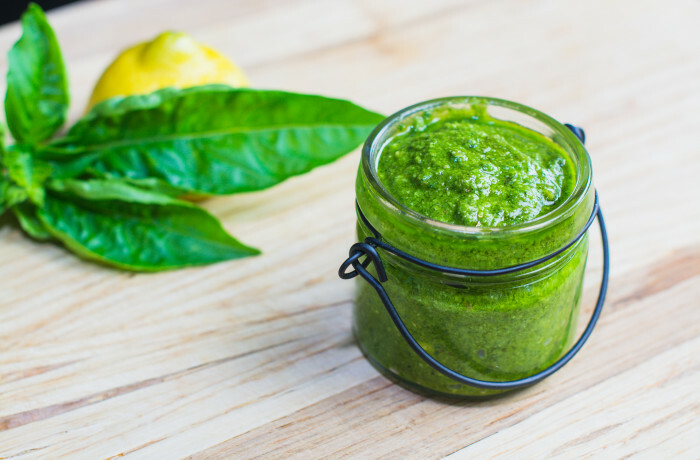 Place the following ingredients in your blender or food processor in the following order: olive oil, basil, garlic clove, lemon juice, walnuts, salt, pepper and parmesan cheese. 4. Blend to desired consistency. 5. If dressing pasta, utilize 1/2 cup of pesto sauce per pound of pasta. Tastes great on fish, eggs, even toast. Enjoy!